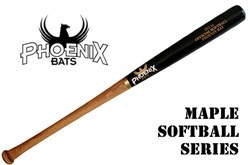 We carry a large variety of high quality maple wood bats from leading manufacturers including Sam Bat, Old Hickory, Rock Bat, Max Bat, A Bat, and many more. Below is our entire selection of wood bats made from rock maple (also called sugar maple). The Marucci JB19 Jose Bautista Pro Model Maple Wood Bat offers unmatched performance and style at the plate. Engineered for hitters who are looking for balance and power in their swing. Bats usually ship within 24 hours. FREE SHIPPING! 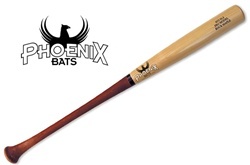 The Sam Bat Model MMO has a thin 15/16'' handle that evenly tapers to the 2 1/2'' barrel. Used By Eric Byrnes, Alex Cintron, Rondel White, and John McDonald. Choose from Cherry Handle / Black Barrel or all Natural. All Sam Bats have a weight drop of approximately -2 to -3. FREE SHIPPING! The Sam Bat Model RB8 has a 29/32'' handle and a flared knob and a full taper from the handle for comfort and power. . FREE SHIPPING! The Model CD1 is the model that we would recommend when transitioning from an aluminum bat to wood. It is based on the T141 profile. Used By Troy Glaus, Jacques Jones, Dioner Navarro, and Hanley Ramirez. Choose from All Black or Cherry Handle / Black Barrel. All Sam Bats have a weight drop of approximately -2 to -3. Bats ship within 24 hours. FREE SHIPPING! Old Hickory’s Custom Pro series of maple and ash bats are the same ones they send to their pro players. You have your choice of wood, model, length, weight, color, cupped or solid end and barrel personalization. All of these bats are cut from #1 graded, hard, rock maple and top graded northern white ash. Choose from 10 of their most popular maple and ash models! Choose from 4 maple bat models that are stocked and ready to ship! Available in black only. The Model 99 is a small to medium handle (.92"), large barrel (2.56") bat. While the 99 is barrel-heavy, it is easy to swing, control, and get good bat speed. For a large barrel bat, the 99 feels fast. The 99 barrel thins pretty quickly, but it doesn't thin too much so as to cause vibrations. A good choice for either a contact or power hitter who likes a thinner handle, larger barrel bat. 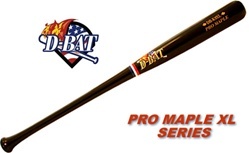 Only select Sugar Maple is used for the D-Bat Pro Maple Series Wood Bats. This is the same wood they sell to the Pros! Pick your bat model, then pick your colors! Choose from 10 bat models. 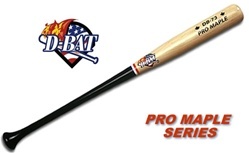 Same as the DBAT Pro Maple Series, but with larger barrel bats. Only select Sugar Maple is used - this is the same wood they sell to the Pros. Pick your bat model, then pick your colors! Choose from 8 bat models. Crafted of the finest Rock Maple available and dipped in a black satin finish, The M643 has an X-large 2 1/2" barrel, a 7/8" handle, and a 1 7/8" knob. Akadema's Tacktion Grip Rock Maple bat allows for a more secure grip on the handle, virtually eliminating the need for pine tar. The Model 71 is a medium flared handle (.93"), medium barrel (2.51") bat. The little extra wood at the base of the handle makes the handle feel considerably thicker than its .93 inches. A versatile bat, good for contact hitters who also want power in a larger, heavier handle bat. The Model 41 is a thin handle (.90"), medium barrel (2.50") bat. The 41 is clearly barrel-heavy, but not so much that it's still easy to control and generate good bat speed. The 41 may be a good choice for a contact hitter who likes a thin handle, and medium barrel, fast bat. 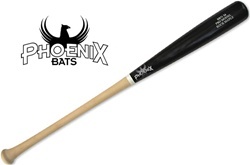 The Model 56 is a medium handle (.93"), large barrel (2.53") bat. Although barrel-heavy, the 56 is easy to control and swing. A hitter can control the bat and generate good bat speed even without a lot of strength. The 56 barrel has plenty of wood to drive the ball with authority. This is the Jason Giambi pro model, available in ash or maple. This model has a thin handle with a small tapered knob. Has a large sweet spot for the long ball, with a pro profile. This is the same model that the slugger uses. Choose from multiple color combinations for a truly personalized bat! This is a standard Model 73, with a Large Knob and big barrel. This is a very popular model in the big leagues. Modeled after the Bonds B2K, the 73 is a popular model among thin handle fans that like the "LOCK" feel of the knob when swinging through the zone. The Large Knob acts like a counter balance. Available in ash or maple. Choose from multiple color combinations for a truly personalized bat! 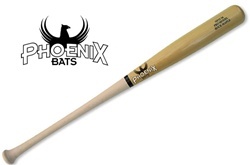 One of the most durable, lightweight maple fungo bats on the market. This custom pro maple fungo from Old Hickory is completely customizable. Coaches may choose standard colors or use their team colors and personalize their maple fungo with their name or team’s name.